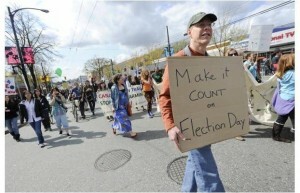 We are a now into the last week of the 2011 Canadian election campaign. Despite an escalating sense of urgency among climate scientists, climate policy has not been an important issue in the campaign. This election is in marked contrast to the previous 2008 election, in which the Liberal Party made a carbon tax a centrepiece of their campaign. That election was disastrous for the Liberal Party and the political reputation of the carbon tax. During that campaign, Conservative Prime Minister mocked the Liberals’ proposal, saying a carbon tax “will actually screw everybody across the country.” Harper went on the win a minority government and Liberal leader Stephane Dion resigned. Environmental issues are facing an uphill battle again this year given Canada’s tenuous recovery from the Great Recession. Recent polls on the most important national issue of concern place environment around 5 to 6%, well below the dominant issues of health care and jobs/economy. All five parties in the federal election now having released their election platforms, and it is useful to take stock of what each of them has to offer in terms of climate policy. We analyze the platforms of each party around three central questions: (1) what targets have the parties proposed for greenhouse gas reductions? (2) what policy instrument do they intend to use to implement the target? and (3) how do they propose to deal with the distributional issues? The Conservative Party platform makes very general references to acting on climate change, but is virtually silent on plans to address it. It mentions its Copenhagen Accord commitment target of 17% reduction in greenhouse gases below 2005 levels by 2020, “aligned” with those of the Obama administration (p. 41). But the platform does not mention any specific proposals for action other than the ecoENERGY Retrofit-Homes program. There is no discussion of their proposal to use command and control regulations for large sources, although in other campaign communications they have made clear this continues to be their preferred policy instrument. They have been openly critical of other parties’ plans for cap and trade. One-time Environment Minister John Baird held a news conference on April 5th in which he attacked the Liberal Party’s plan for a cap-and-trade system as “un-Canadian”, calling it unpatriotic for pitting regions against one another. (The Conservatives supported cap and trade in the 2008 election.) Their platform does not discuss how to deal with any distributional issues or cost impacts of implementing regulations. A Globe and Mail Economy Lab piece by Andrew Leach shows that the regulatory and other proposals announced by the Conservatives thus far will come no where near meeting their 202o target. The New Democratic platform echoes that of the Liberals in its support for the Bill C-311 targets (which was introduced by the NDP in the 40th Parliament) and a Canada-US cap-and-trade system. They recommit to the target of 80% below 1990 targets by 2050 (p. 13). They commit to establishing interim targets, but do not say what they are or how they will be developed. The NDP cap and trade plan “will establish hard emissions limits for Canada’s biggest polluters.“ The scope of coverage for the system thus seems to be narrower than the Liberals’ economy-wide commitment. The NDP go beyond the commitments of their Liberal counterparts in detailing how they would use the action revenues raised through their cap-and-trade program. According to their platform, a New Democratic government would use the revenues to invest in a host of priorities, including green technologies, business and household energy conservation, public transit, renewable energy development, and helping workers transition to the new green economy. Questions about the plausibility of generating the revenues required to fund all of these commitments so quickly from an auction were raised by Andrew Leach and reported in the Canadian Press. The platform does not, however, specify how the party plans to deal with regional equity issues. The Bloc plan pushes for the 2012 achievement of those Kyoto commitments that are still possible, while moving toward a medium-term target of a 25% reduction in emissions below 1990 levels by 2020 (p. 121). As can be expected from a regionally-based party, the Bloc Quebecois eschew the current sectoral approach in favour of a territorial approach like the one used in the European Union (p. 122). While it is not stated explicitly, presumably this means that each province would have an individual emissions target. Under such a plan, each province would be able to implement their own GHG mitigation measures, while the federal government would be free to undertake national programs so long as the target policy arena fell under its exclusive jurisdiction. Integral to the achievement of this reduction target is the setting of a hard cap on carbon emissions and the creation of a “carbon market”. This is in essence a cap-and-trade system for corporations, and would be monitored by a new independent watchdog organization (pp. 122-123). Financial penalties would be imposed on companies that failed to meet their targets (p. 123). The Bloc’s plan does not make clear whether the initial permits would be auctioned off or given away. below 1990 by 2040 regardless of what other countries do” (p. 35). These targets will be pursued both through carbon tax and cap and trade. The platform specifies that the carbon tax will be carbon neutral, and that revenues from the tax will be used to reduce incomes taxes, introduce income splitting, and provide a carbon pricing rebate. The platform does not, however, describe how the plan will deal with regional equity issues. All five parties set targets that, if implemented, would have substantial impacts on the trajectory of Canada’s emissions its energy system. There are significant differences in base years used, target years, and percentage reductions. The Green Party’s are unquestionably the most ambitious. The NDP and Liberals use the same 2050 target but do not specify interim targets. The Conservatives have an interim target but no long term target. The five parties use different policy instruments to attempt to meet their targets: the Conservatives rely on emission regulations, Liberals, BQ, and NDP on cap and trade, and the Greens on a carbon tax and cap and trade. It is one of the great ironies of current political positioning on the issue that the Greens have adopted the instrument most favoured by economists and the Conservatives have adopted the demonstrably least market-oriented and least cost-effective initiative. This curiosity was highlighted in the last week of the campaign by Mike De Souza of the Canadian Press. The five parties have dramatically different levels of specificity in how they would address the distributional issues of implementing effective climate policy. The Conservatives and Bloc are silent on the issue. The NDP and Greens both have considerable detail on how would use revenue raised from the carbon pricing, but do not address regional equity issues. The Liberal platform provides a general commitment to regional equity, but no details on how auction revenues would be used. Through its inaction, Canada’s international reputation on climate change has been tarnished. All five parties commit to climate action, but with varying levels of detail and some quite sharp differences on targets, instruments, and distributional issues. Canada needs a serious national conversation on climate action. Why not get it started now when so much of the public is focused on national politics? Let’s spend at least part of the last week of the campaign focused on this vital issue. significance for federal climate policy. or nuclear energy production increases?